I like the new OP much more than the last one. 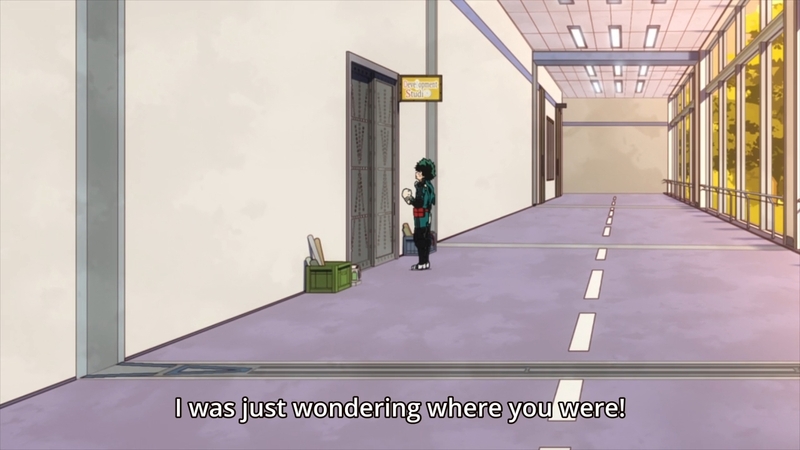 But hey, My Hero Academia is back after a short, one-week hiatus. Welcome to the post-DARLING in the FRANXX world! 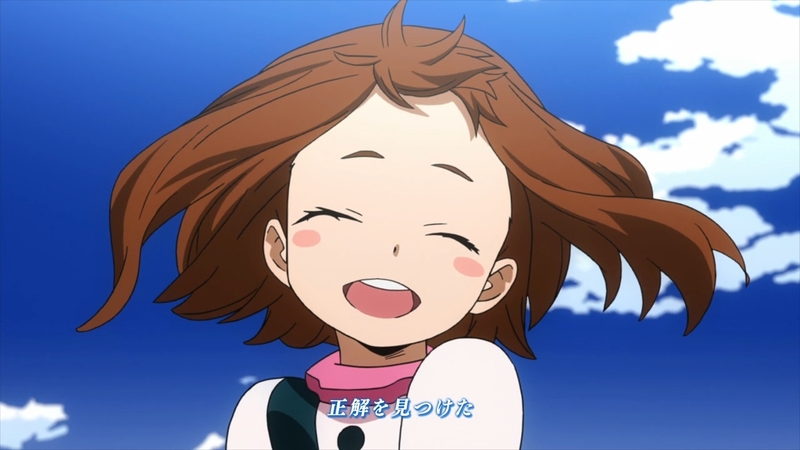 — Uraraka is such a Genki Girl. I mean, she’s cute and all, but I wish she had a larger role in the story if they’re going to feature her like this in the OP. Sometimes, it feels like she’s just in the story for the “Will they or won’t they?” suspense. 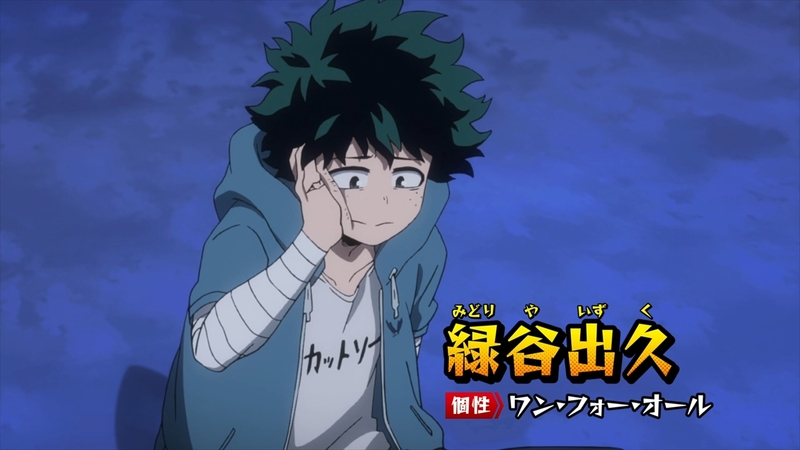 — Yeah, Deku did manage to escape from the last incident without injuring his body… but to be fair, he also didn’t do any fighting. Wake me up when he can fight and also avoid breaking a bone or two. 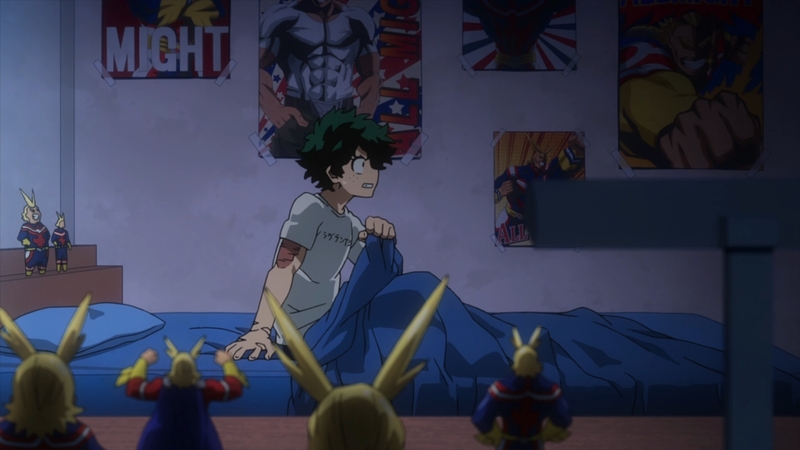 — Dude, not only are you surrounded by All Might stuff, you wake up from your sleep screaming his name. — Aizawa tells the kids that the provisional license only has a 50% passing rate. Why do I get the feeling that everyone in 1-A is going to get one anyways? — So what’s the gimmick this week? Come up with two ultimate moves for your arsenal. Oh boy. 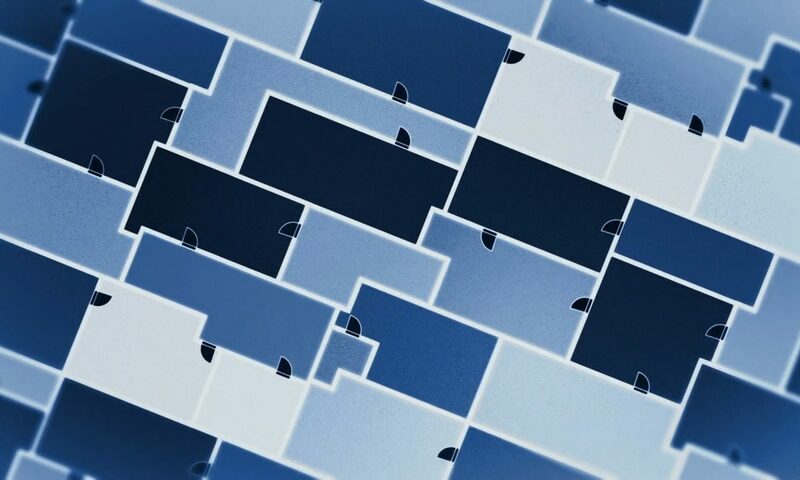 Ultimate moves are like fingerprints, apparently. Nobody else should be able to copy yours. And according to one of the instructors, the ultimate move is supposed to give you a sure win. But if everyone has an ultimate move — two, in fact — nobody can win. — Unfortunately, this long lesson on ultimate moves goes on and on and on and on… I’m getting super bored right now. — Finally, we can get on with the rest of the show. — Every kid — hero or otherwise — has probably conjured up with some made-up “ultimate” move while growing up. They now get to fulfill those childhood whims. Unfortunately, Deku has two problems. First, he can’t rely on his arms too much, or he’ll lose his use of them. He’s also too similar to All Might, a fact which the latter points out himself. This brings me to his second problem in my mind: his Quirk is so plain Jane and ordinary. All he does is punch. How is he supposed to change it up? Throw in some kicks? 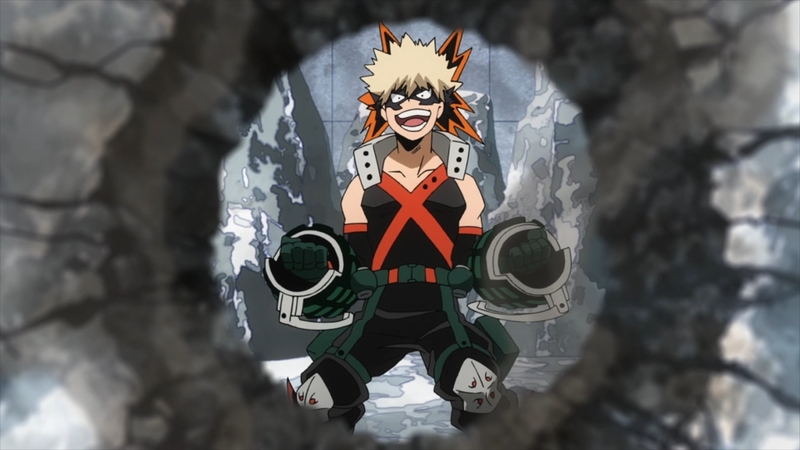 — Same as before, Bakugo excels at almost anything combat-related. 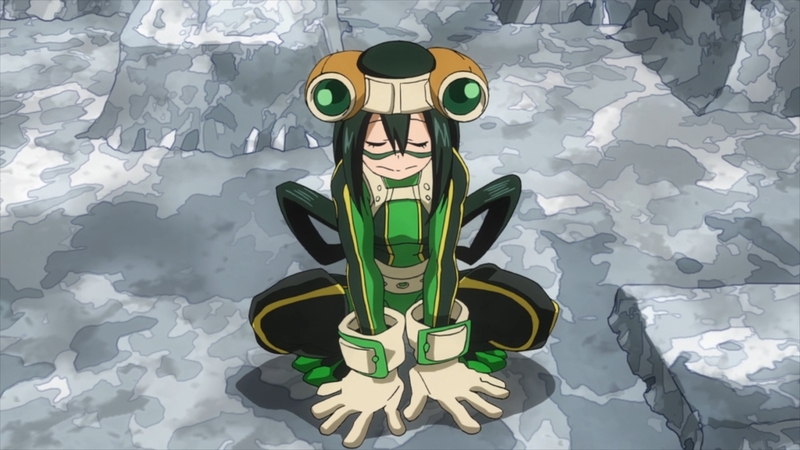 — As for Asui… I mean, she’s a frog. She’s already an ultimate move unto herself. 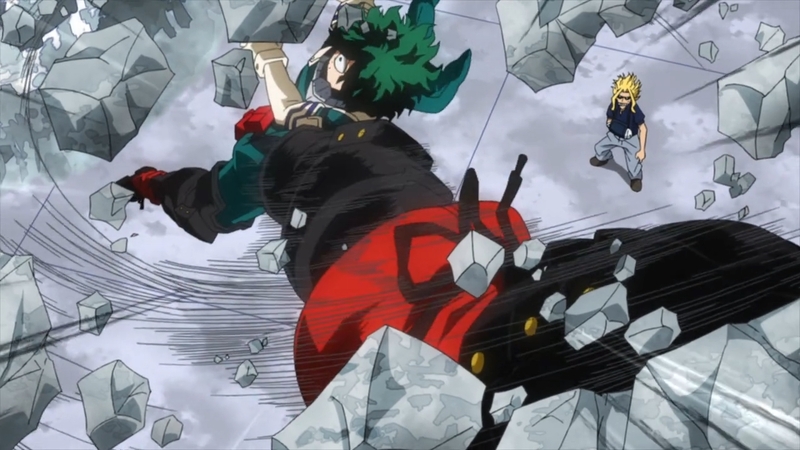 — To be honest, Deku’s main advantage appears to be his ability to feel out a battle and strategize. Unfortunately, it seems like an ultimate move has to be an overt show of physical ability, but the kid already swings the odds in his favor by simply using his brains. I’d classify that as an ultimate “move” of sorts, y’know? 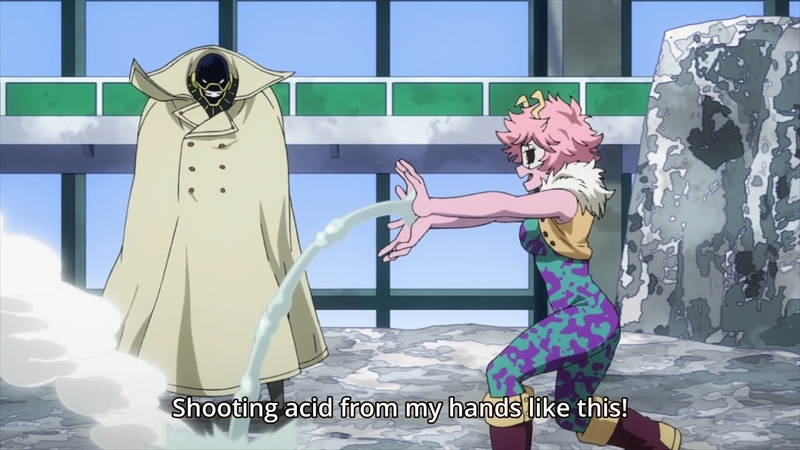 If he wants to be unique from All Might, well there you go. 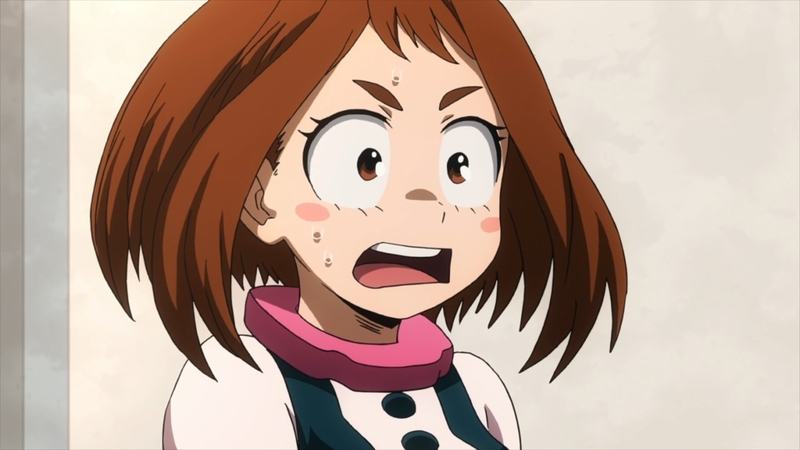 — Oh hey, it’s Hatsume, the “rival.” Just look at Uraraka’s reaction. Hey, don’t forget about Toga either. Man, what a casanova. — Technically, she’s not much of a rival. After all, she can’t even remember his name. 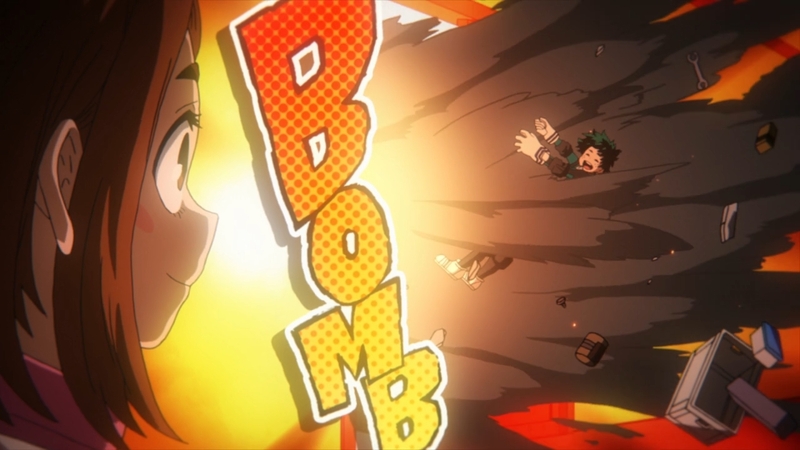 All you get are moments like this one to make Uraraka feel jealous even though she personally wanted to keep things platonic between her and Deku. But let’s be real: this is a shounen so you can just kiss romance goodbye. If our hero ever gets with anyone, it probably wouldn’t happen until the series is practically over (like 800 episodes from now). — Hatsume has a much older sounding Japanese voice than I had expected. Hey, the last time I saw her, I was watching the dub. — Looking good, Deku. 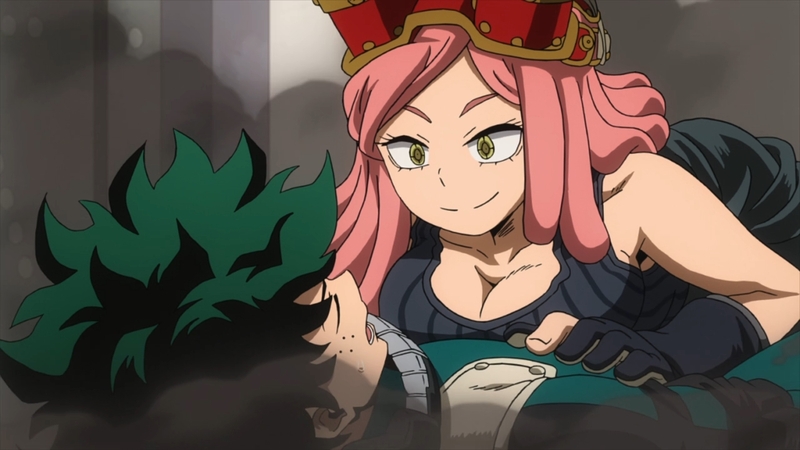 You’ll always feel supported if you waifu Hatsume. — This girl needs a QA team. — Well, at least this part of the episode is amusing. — Plus, Hatsume inadvertently manages to serve as Deku’s muse. She has no common sense, but at the same time, this allows her to be innovative. Not everything she invents is going to be useful, but she comes up with so much crap that there’s bound to be a diamond in there somewhere. — Sugar guy’s suit should just inject him with insulin or something. 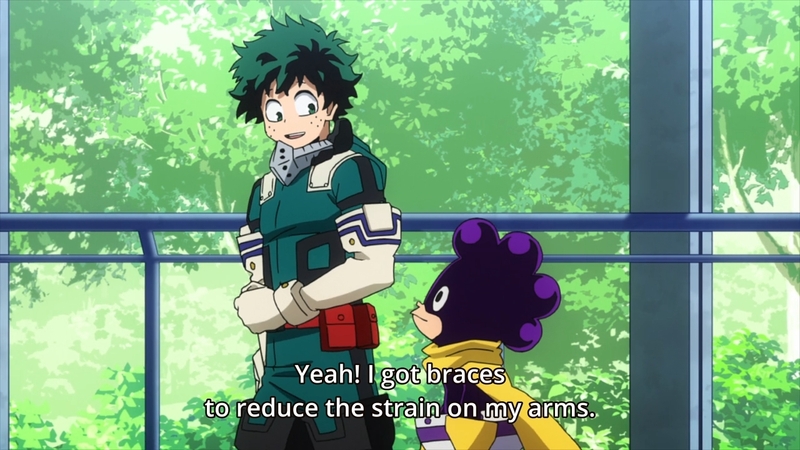 — In terms of aesthetics, Deku’s new braces don’t mesh too well with the rest of his costume. 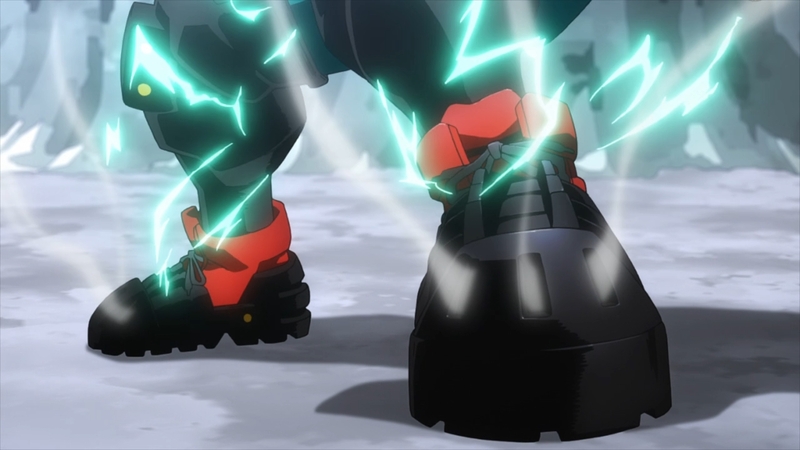 — Deku then gets to show off his ultimate move by, well, kicking with his brand new kicks. Welp. 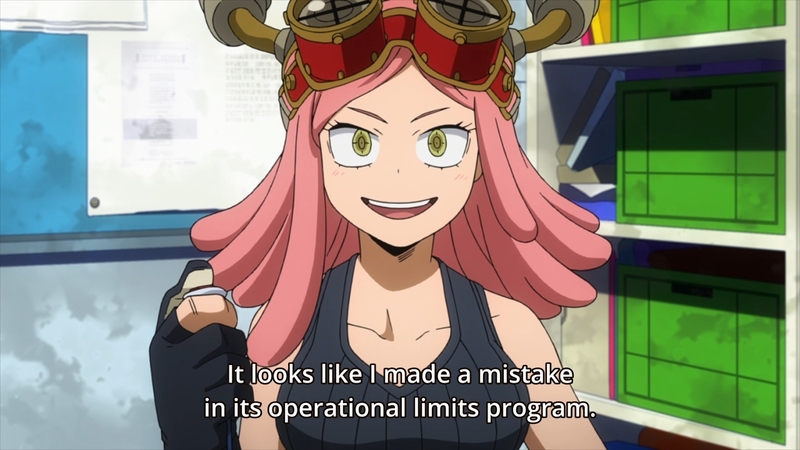 — Kind of a boring episode, but the Hatsume bits were funny. Anyways, I don’t expect the story to be interesting until the main conflict of the arc is finally introduced. — I can’t wait until the kids get to do some field work or something. 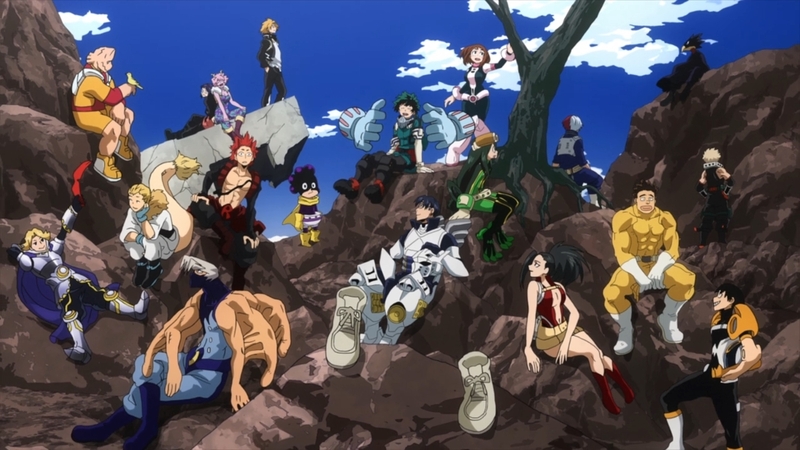 What I’m missing from My Hero Academia is the sense of adventure that you often find in other shounen series. Going to new places, seeing new people, doing new things. Since they’re still students, they’re all cooped up in one place all the time. Ah well. Well, shoot style looks cooler imo, but I’m not sure I see how it solves Deku problem. I get that he needs to take it easy on his arms because he used them too much, but he’s already broken his legs once or twice as well so they can’t be that far behind. Maybe it can let him keep going in the short term, but for now it just feels like delaying the inevitable. His shoes look like they’re somewhat reinforced, so maybe his legs won’t break as easily. Even so, maybe he should just mature into his body before becoming a hero. I know this would never happen (because we wouldn’t have a show), but there’s a reason why a lot of pitchers aren’t allowed to throw hard breaking balls like sliders in high school. It’s just too much for their arms. 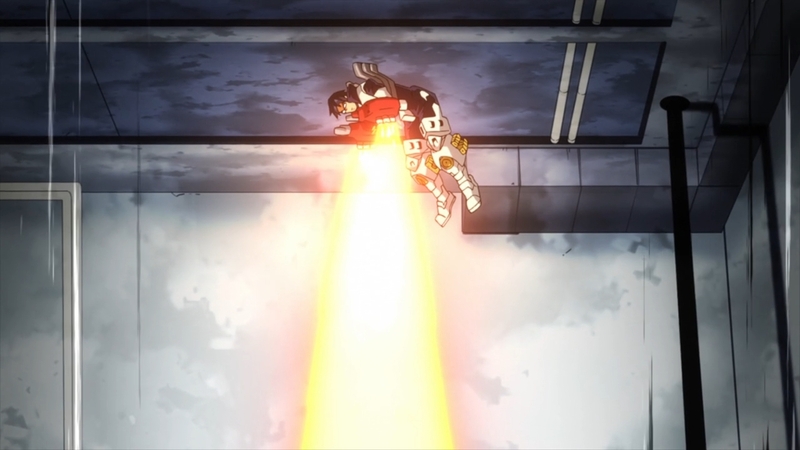 I figured the damage was from him putting to much strain on his own body (broken bones or torn ligaments or whatnot), not necessarily from the external impacts… but maybe the boots have joint braces or something that keep him from accidentally putting too much strain on his knees/hips. I guess that might make sense. And yeah, shonen heroes waiting until they’re seinen heroes to do stuff like this would just make too much sense I suppose. Aren’t legs stronger than arms or something like that? Anyway, the legs work because now he has full cowling. Long as he doesn’t overdo it he’ll be fine. 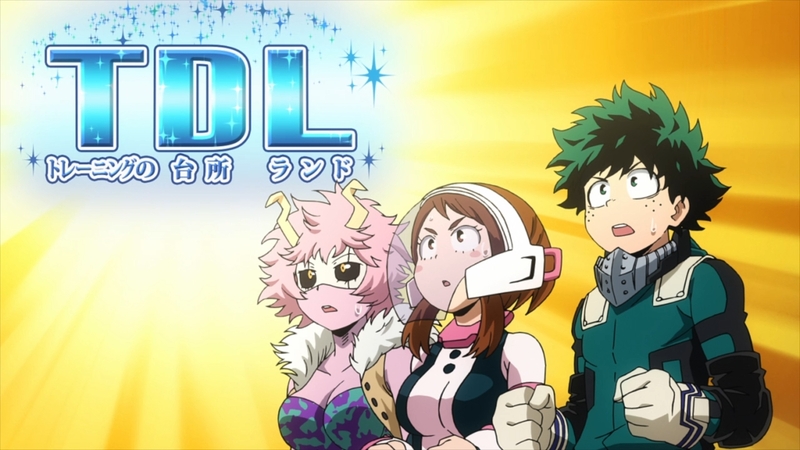 The “TDL” was a joke (probably altered in the anime) comparing the gym and Tokyo DisneyLand, both have the same initials. The school setting would work more if we got more focus on different characters. Even some teacher mini-arcs would be nice. Telling a shounen hero not to overdo it… you hear that, Goku? King Kai told ya not to go beyond Kaio-ken x2! Previous PostPrevious Harukana Receive Ep. 2: Yay for moral victories?